Ivory elegance! 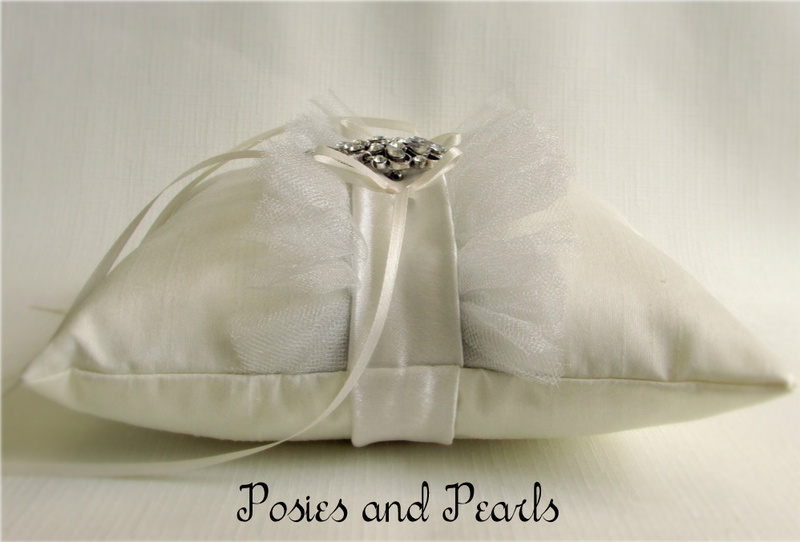 This romantic ring bearer pillow is handcrafted from luxurious dupioni silk. Its soft ivory color and hand-woven texture adds richness to the pillow that is undeniably elegant. 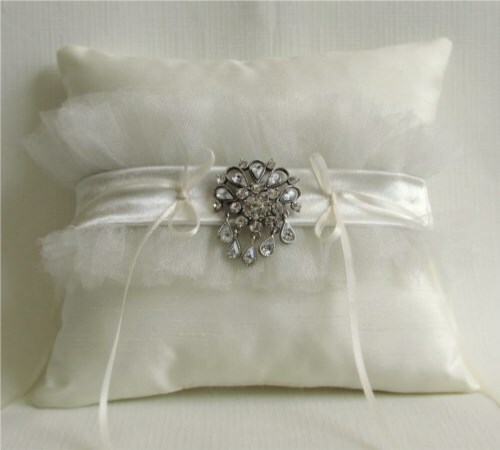 A shining satin sash wraps all of the way around the pillow. 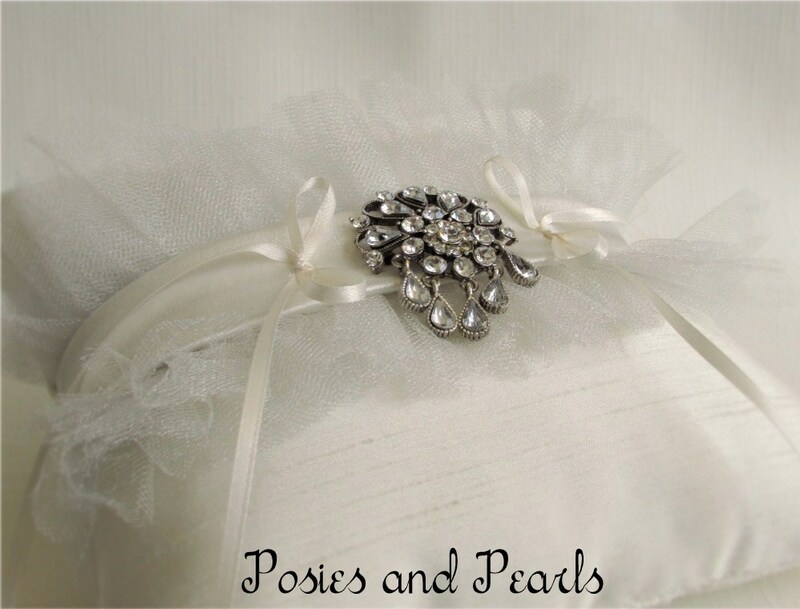 Soft silver tulle is carefully hand sewn into a ruffle and tucked behind the sash along the front of the pillow. At the center rests a sparkling rhinestone crystal brooch. When the wedding day is over, this brooch can be worn as a fashionable accessory. What a lovely way to keep a memento of your special day with you, always! CUSTOM ORDERS: Like this style but have a different color scheme in mind? 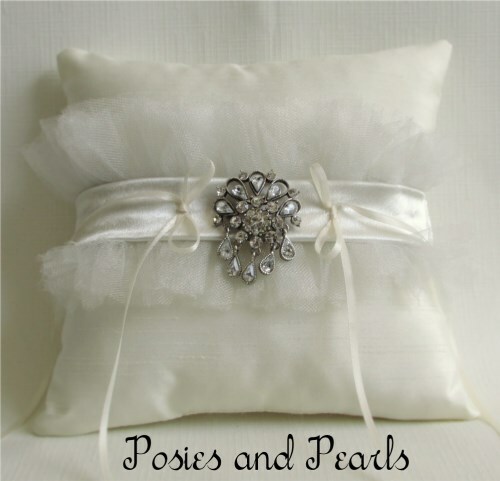 I am always glad to work with you to create custom pillows, bouquets, boutonnieres, corsages, flower girl baskets, etc. Contact me and we can begin discussing a custom design. 100% dupioni silk lined with 100% cotton fabric and filled with 100% polyester fiber. Please note that silk dupioni fabric is a natural, hand woven material. As a result, it displays slubs and striations that are intrinsic to the fabric. These natural variations add visual interest to the overall look of the material.